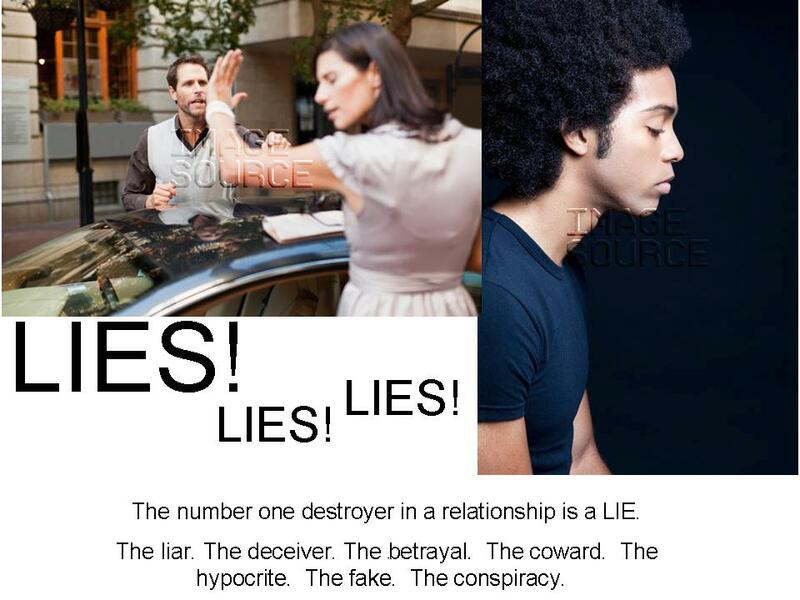 The number one destroyer in a relationship is a lie. The liar. The deceiver. The betrayal. The coward. The hypocrite. The fake. The conspiracy. All of these things are results of a lie. The problems of the world, government, relationships, and families are all because of a lie posing as truth. Generally when we lie, we are either hiding the truth or hiding from the truth. There are many reasons how and why we lie. Folk will lie to be with someone, by pretending to be someone they are not. Think of selfishness. It is a mental euphoria that causes one person to think in this great big world that he/she is all that matters. It takes a lie to be full of yourself, yet in a relationship pretending to be a team player. It takes a lie to say you will be a good partner, when you don’t have the wherewithal to be a good person. Folk who walk around in anger believe they should be angry at someone, when in truth, they should be angry with themselves. They are the cause of the anger. I’ve seen folk end relationships in the worst way, because they wouldn’t walk away with honesty. In order to end the relationship the person walking away made false accusations to make an exit, but they did it because of a hidden agenda. I know ministers preaching the scripture Isaiah 26:3, that says, “Thou wilt keep him in perfect peace who mind is stayed on thee….” Yet they need a psychiatrist due to a mental disorder or to re-gain mental health? Some folk will believe a lie to justify their need to spread a lie, without factual support. When they are confronted, they create drama to avoid the confrontation of truth rather than reconcile the lie. There is the cheater. Fully aware that any vow or agreement of exclusivity is one conversation they should not engage in— much less agree to. Conditional love exists because of the partner whose love is conditional only by what their partner does for them. In truth love is unconditional. Christians say they speak truth, but engage in gossip which is always comprised of a lie. They say they love others as God does, but will shun someone they’ve only heard has done wrong, yet they cannot prove it to be true. There are those who say they follow truth, but cannot discern a lie when it’s in their face. An unhappy relationship, settling for temporary happiness, by suppressing the problems will only be confronted with bigger problems that can no longer be suppressed. We validate the faults of our partner, when we say nothing and do nothing in order to keep the peace. We can’t validate the problem and then expect change. Don’t want to rock the boat in the relationship? Then don’t lie and say you are unhappy. You are on the boat willingly and going for the ride. A partner who is living above his/her means, and projecting a lie of having more, is creating a cycle of needless spending. There is the partner that gets caught, only to lie again, to get out of the lie he/she got caught in. Let’s not forget the lie that is unspoken by the partner who says nothing and is intentionally lousy in communicating. He/She is trying to be extra careful in not saying anything to reveal anything: only to reveal something by arousing suspicion in saying nothing. This is called lying by omission. There is the lie of a smile, appearing and pretending to be supportive, loving and encouraging only for that same smile to frown into a portal of gossip when your back is turned. This perpetuates the cycle of back biting. A lie, with intent to mislead, while looking its victim in the eye, is a trait indicative of pathological behavior. In an article called, “The Problem With Lying” on the blog called, The Trusted Advisor, http://trustedadvisor.com/trustmatters/the-problem-with-lying It explains how everyone lies, but I was most impressed with the article’s focus on the motive as to what motivates us to lie. The article addresses that we may apologize for lying, but is it just as easy to remove the motive for the lie? Are we as a society creating the motive for those who lie to us? Perhaps, we as a society have made the lie one of the biggest problems we face more often than necessary. Forcing a person to stay in the relationship, and using children as pawns, encourages and creates the motive for cheating. We judge people without having all of the facts. Make folk an outcast, because of our religious beliefs, prejudice, or simply because they choose a path we will not go— for whatever reason. We misjudge, rather than accept the fact that we all have a course in life we must take. We scandalize someone’s name because of how they choose to live or the decisions they choose to make. Our high-mindedness, religious and belief systems are often violated, because we are holding others to a perfect standard that we ourselves won’t live. In order to be free of our gossip, and verbal put downs, we have forced people to lie to us to avoid the behavioral cruelty we put them through. We force people not to tell us the truth, because the truth about ourselves we refuse to accept. We say the words, “Live and let live” but it is not as liberating as we make it out to be. It comes with a contingency. We will let you live, only if you do as we do, and if you say as we say. If you make us comfortable in the way you choose to live— then we will let live. It may be wise to consider that for each action we take, we force a reaction. It is called “Cause and Effect” (causality). Are we forcing our partner, friend or family to lie to us? If so, we have launched an even bigger foe, and it rocks our trust, shatters our confidence, shapes how we love and it changes our lives. We have created the biggest destroyer of all, the LIE. This entry was posted in Destroy and tagged encourage the lie, lies in government, Lies in relationships, lies in the church, why do people lie?, why our spouse and partner lie to us. Bookmark the permalink. 2 Responses to Lies! Lies! Lies! Good stuff here, Natalie, and thank you for the reference. Lying, as you point out, is multi-faceted and complex. But it’s almost always guaranteed to be a destroyer, and I’m only saying ‘almost’ to be careful.